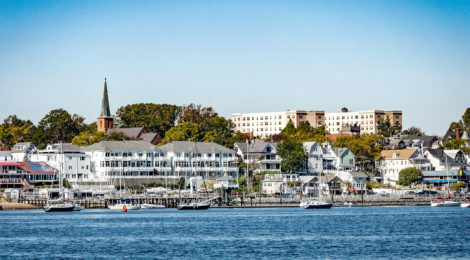 Perth Amboy is known as a friendly and welcoming city by its longtime and new residents, local businesses and the thousands of guests who visit annually. People who enjoy great cuisine appreciate Perth Amboy’s many noteworthy restaurants and fast casual cafés that serve exceptional Latin American and Caribbean basin cuisine. All year long, Perth Amboy, known as the Bay City, hosts a range of special events, food festivals, art shows, outdoor concerts and waterfront activities that are fun and free to attend. 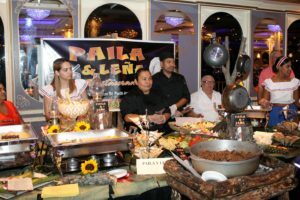 Paila & Leña Dominican Restaurant earned the first place for its cuisine at the 2017 Taste of Perth Amboy. This year’s Taste will be held on October 17. By blending together a range of cultures, traditions and backgrounds, Perth Amboy has created a vibrant, diverse and exciting downtown. The City’s bustling business district is home to many locally-based retailers that carry a wide variety of unique, affordable and stylish merchandise. Two of the many advantages for shopping in the Bay City, which is in an Urban Enterprise Zone, is that customers will find great bargains and save by paying just one-half of the New Jersey sales tax on their purchases. When it comes to hospitality, Perth Amboy has been welcoming visitors since the late 1600s. Colonial-era travelers often began the journey from New York City to Philadelphia by taking a vessel to Perth Amboy. The City’s friendly spirit lives on today. Perth Amboy proudly blends its historic legacy with its 21st century approach to serving guests while striving to build a community that engages longtime residents and welcomes new ones. For generations, hardworking, industrious and family-focused immigrants have settled in the City, and they have launched small businesses while making many noteworthy contributions to the community’s character. The City is on the threshold of making big changes to its downtown environment. Next year, New Jersey Transit is staring a $47 million renovation and expansion of the historic, Perth Amboy train station. At the same time, Mayor Diaz, local business owners, private developers and Middlesex County’s government are planning a Transit Village with a parking deck, multifamily housing and mixed-use properties that will have both commercial space and residences with affordable rents. 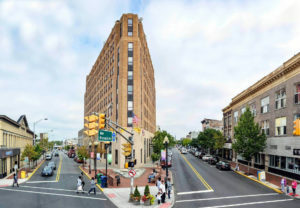 Five Corners , shown above, is the heart of Perth Amboy’s bustling downtown. Even before the proposed Transit Village takes form, the City’s Office of Economic and Community Development plans to draw more diners and shoppers to the heart of the downtown by introducing its “Parklet Concept.” In the first phase, the sidewalks by restaurants are being extended to make room for more outdoor dining. Later this year, additional al fresco dining “Parklets” maybe added. Future plans call for a Pedestrian Plaza with outdoor seating, a farmer’s market, shopping kiosks and a relaxing environment. To honor Perth Amboy’s history, the city is planning to begin horse-drawn carriage tours. Offered on weekends, the tours will start at City Hall, which is America’s oldest municipal building in continuous use. The guided tour includes City Hall Circle and the Bill of Rights Arch that honors a landmark event in American history that occurred here in 1789. Legislators met in Perth Amboy, then the co-capital, and voted to ratify the Bill of Rights and New Jersey became the first state to take that action. The tour continues with a stop at the Proprietary House, which was built in 1762 as the official residence of the Royal Governor of New Jersey. This is only, original Royal Governor’s Mansion that remains in the nation. 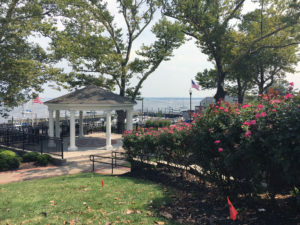 Perth Amboy’s new Bayview Park offers a beautiful view of Raritan Bay, where during the summer, the City presents free outdoor concerts. The Bay City’s shoreline stretches along the Raritan Bay. 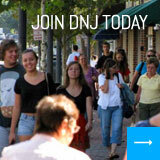 The area has been beautifully restored following the devastation by Super Storm Sandy. The waterfront area includes parks, beaches, 1.5 miles of walkways and shore-side restaurants as well as new tennis courts, volleyball nets, and exercise stations. Perth Amboy Marina offers slip rentals during the boating season and people can fish from the pier. The nearby Bayview Park is the venue for the City’s free concerts. The City hosts a number of special events that range from the Taco Festival on Cinco de Mayo, the Art Festival during Memorial Day weekend and the Celebrate Perth Amboy Fireworks that honors America’s Independence Day.